Achievers Adda: A great motivational story "Who is packing your parachutes"
Plumb ejected and parachuted into enemy hands. He was captured and spent the next six years in a Communist prison. He survived that ordeal and now lectures about lessons learned from that experience. One day, when he and his wife were sitting in a restaurant, a man at another table came up and said, "You're Plumb! You flew jet fighters in Nam from the carrier, Kitty Hawk. You were shot down!" "How in the world did you know that?" asked Plumb. 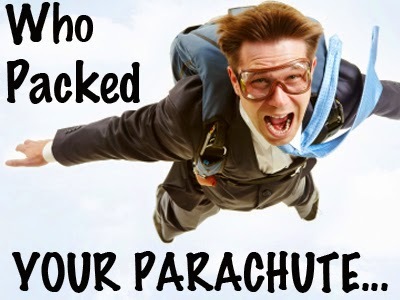 "Oh, I was the one who packed your parachute," the man replied. Plumb gasped in surprise and gratitude. The man smiled and said, "Yep, I guess it worked!" Plumb assured him, "It sure did work -- if your chute hadn't worked, I wouldn't be here today." Plumb couldn't sleep that night, thinking about the man who has packed his parachute. Plumb kept wondering what the man might have looked like in a Navy uniform. "I wondered how many times I might have passed him on the Kitty Hawk. I wondered how many times I might have seen him and not even said good morning, how are you or anything, because you see, I was a fighter pilot and he was just a sailor." Plumb thought of the many hours the sailor had spent on a long wooden table in the bowels of the ship carefully weaving the shrouds and folding the silks of each chute, holding in his hands the fate of someone he didn't know. Now Plumb asks his audiences, "Who's packing your chute?" Everyone has someone who provides what they need to make it through the day. Plumb also points out that we all need many kinds of parachutes. We need mental, emotional and spiritual parachutes as well. While a prisoner of war, Plumb called on all of these supports before reaching safety. His experience reminds us all to prepare ourselves to weather whatever storms lie ahead -- and to recognize and appreciate all of those people who pack our parachutes everyday, for they are the ones who truly deserve the credit for our survival.